Very Important 60 Minutes Segment! – Heroin. Stop the Silence. Speak the Truth. Reeling after watching this horror show. 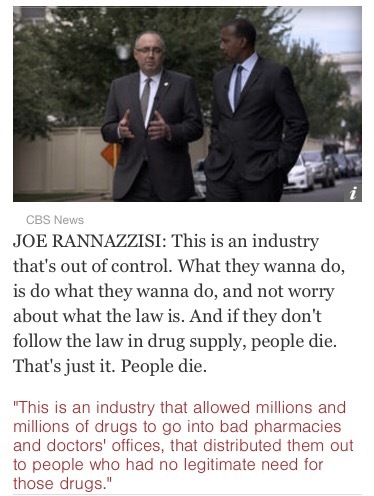 Marino as drug czar! !First thing is in the morning I am calling my broker to be sure I do not own any stock in Cardinal,McKesson or AmerisourceBergen’s. A March on Washington to demand repeal of this bill. After losing my daughter, I have been torn between never wanting to hear another word about opiates to wanting desperately to create change. I am sure that I am not alone with his feeling so I urge everyone affected by addiction to act. Hang in there Mama. Finally they call you back when they can’t find her…..
We lost our Son in 2015. I am just sickened by this news. God help us all. So many many more are going to die from addition. Generations gone. Why doesn’t anyone care. Why is the US in such turmoil? What has happened to caring and loving and family and Faith? Money is evil. It needs to stop. I saw the segment and was sickened! Now what?? The whisleblowers were fired and the congressman was put in a position of power by our current president… Now what? Write and phone your Senators and Congressmen. Spread the word. Write the White House (tweet Trump!). Trump has already had to respond to the segment. We need to keep up the pressure! Let’s get the President to have actions follow the words he’s spoken today.